Nebraska VR is an eligibility program that helps individuals with physical, mental, intellectual, emotional, and learning disabilities to identify their strengths and abilities in order to find success in the world of work. Customized and individualized services are tailored to specific needs and job goal with the supports necessary to help with employment success. As part of our dual customer approach, we also work with businesses to provide qualified job candidates from our untapped pool of job seekers. Partnering businesses also provide unique opportunities to participate in job shadows, workplace tours, and mock interviews to help identify the work conditions that will provide meaningful and rewarding employment. Nebraska VR must provide a full range of vocational rehabilitation services, as appropriate, to all eligible individuals who apply. When these services cannot be provided to all eligible individuals due to limited funding, Nebraska VR is required to implement an Order of Selection Policy. Under this policy, priority is determined during the eligibility process based on how significantly a disability impacts someone’s ability to work. Nebraska VR has three priority categories and at the moment all three of the priority groups are closed. In October, Nebraska VR will begin contacting individuals with the most significant disabilities (Priority Group 1) on the wait list in order of application date. Plans will be written and services provided to those contacted and in need of our services. Nebraska VR will continue to contact and develop plans with individuals on the wait list so long as sufficient case service funds are available. For those who have not yet applied for Nebraska VR services, setting up an appointment to meet with an employment specialist is recommended. Though funds are limited, we are taking applications. Information and referral services are provided as part of the process. 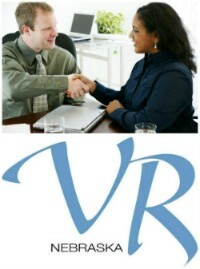 After meeting with VR staff, you may be referred to partners in the workforce system like an independent living center or the American Job Center. You will also leave the appointment with a list of agency and community resources that may be able to help meet your needs. To learn more about Nebraska VR and Order of Selection, go to: http://vr.nebraska.gov/. The Hotline for Disabilities is a great resource you can contact today. They will work with you to connect you with agencies and services to meet some of your immediate needs. 800.742.7594 or 402.471.0801, email at shari.bahensky@nebraska.gov. You can also go to their website at www.cap.nebraska.gov to view the directory of resources.